This past weekend we did our annual apple picking with friends. The apples this year were slim pickings as we had a warm winter which brought out the flowers early then we had some bad storms that knocked the flowers off. Then a lot of the apples have hail damage. But we managed to get 30 1/4lbs! So we have to do something with them! I decided to start with the apple cake. I got the recipe from the Pillsbury The Complete Book of Baking cookbook. You can see the hail damage but they tasted just like they are supposed to be. Preheat the oven at 350 F and grease and flour a 13″ x 9″ pan. 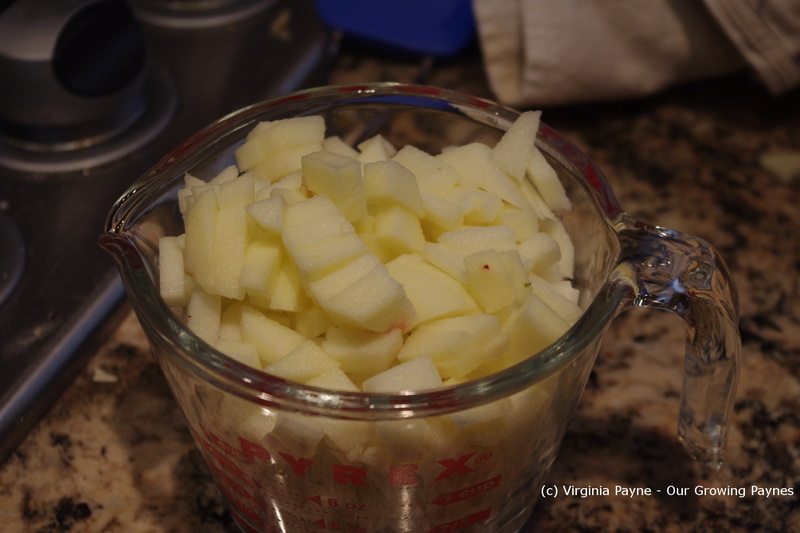 Peel and dice into small pieces enough apples for 1 1/2 cup. It was about 3 apples for me. 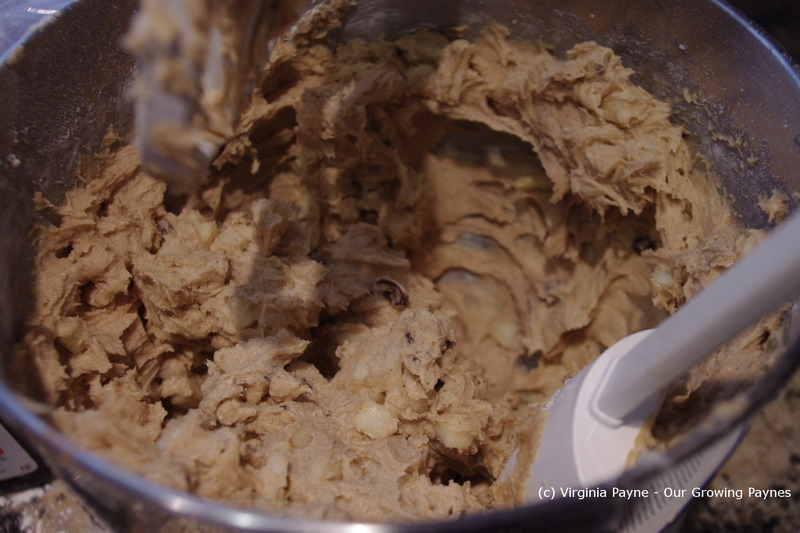 Mix 3/4 cups of softened butter with 1 1/2 cup of packed brown sugar. Just realised that I used a cup of butter. Came out ok though. 🙂 Then add 3 eggs, 1 1/2 tsp of cinnamon, 1/2 tsp salt, 1/2 tsp baking powder, 1/2 tsp baking soda, 1 tsp vanilla and mix together. Then add 1 3/4 cup of flour. Mix then add the apples. I also added 1/2 cup of raisins. There is an option of adding nuts as well but we leave those out. Mix thoroughly. Spoon into the pan. The recipe says pour, good luck with that. 🙂 The batter is on the thick side. Bake 30-40 minutes or until the toothpick check comes out clean. 30 minutes worked for our oven. Let cool and serve. Just under 30lbs of apples to go! 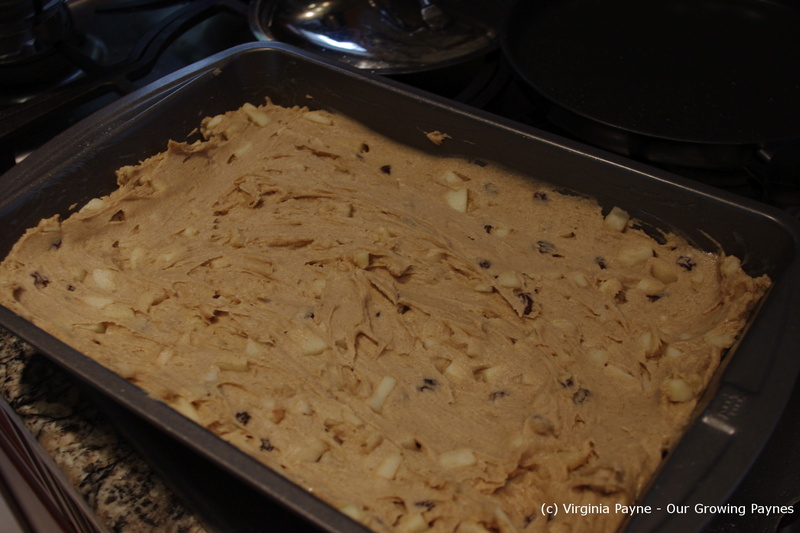 This entry was posted in Baking and tagged apples, autumn, baking, cake, food, raisins. Bookmark the permalink. I will have to check the recipes out. Thanks for stopping by. The recipe did come with a bit about caramel topping but I didn’t make it as it was a lot of sugar! What’s better than an apple cake? 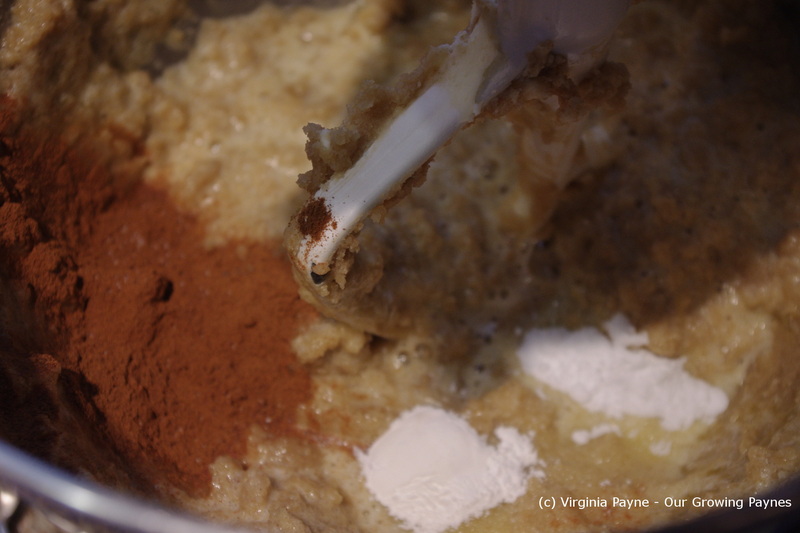 Honestly, I think it is the best fruit for cakes and a bit of cinnamon completes it all. Yummy! A perfect autumn recipe, can’t wait to give it a try! Oh don’t stress about the award. It does take a bit of work! I made apple cake this afternoon that would probably last until end of tomorrow. We love them! Ever tried fennel seeds with them? The recipe i follow is almost the same as yours except for white sugar instead of brown. They are so delicious! Never thought of fennel seeds. How does it change the flavor? Fennel has a very sweet liquorice flavour that hits you when you bite into them…great with apples in a cake. Great for autumn. Doesn’t last long in this house! 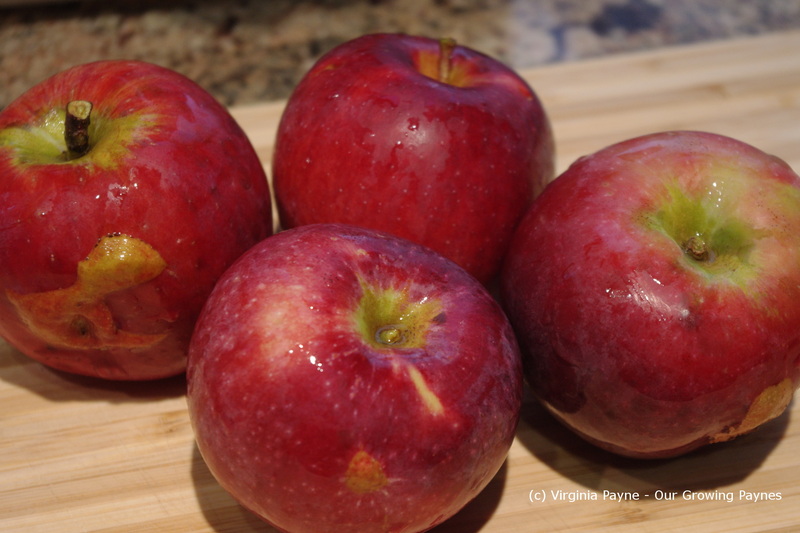 I envy you all those apples…though 30 + lbs is a teensy bit daunting. I think you’ve hit the mark with this apple cake, though. 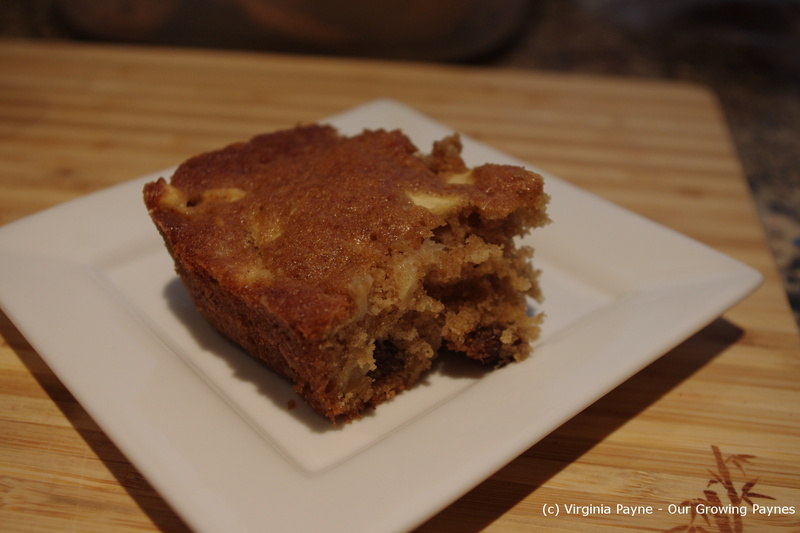 I definitely need to make some apple cake very soon, and am bookmarking your post, thanks! I hope you enjoy. 🙂 I have to make some more this week. A request by the kids! I really like apple cake. My mother-in-law gave me that same cookbook for Christmas one year!!! I’ll have to check it out. My Aunt Bonny makes a really good apple cake drizzled with icing while it is warm. Yours looks equally delicious. I haven’t made the icing yet as it calls for a lot of sugar and we like the cake as is. But I bet it is yummy. I visited from the 2013 link and was just stunned by the background picture of cocktail you’ve posted. Made me want to reach into the pictures and drink it down. The cake seems like a perfect way of using a good amount of apples and I don’t think it needs more than a sprinkle of icing sugar over the cooled cake for garnish. Maybe a scoop of whipping cream with some cinnamon sprinkled on top. I can’t take credit for that photo I’m afraid. It is one of the themes. Though I’ve seen others use the theme with their own photo so I need to play around with that. I would love one of my own photos of a glass of wine.